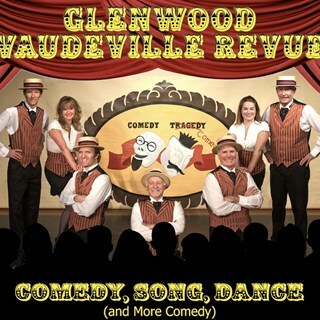 The Glenwood Vaudeville Revue is a two hour family fun dinner theater show with professional talent performing a variety of comedy skits, jokes, high energy dance numbers, unique novelty songs and original comedic presentations that are guaranteed to entertain, and help you laugh your worries away; and all this while you savor a meal prepared by many of the Glenwood Springs best restaurants. All of our shows are entertainment at its finest and have received great reviews; and this year is sure to please young and old alike. 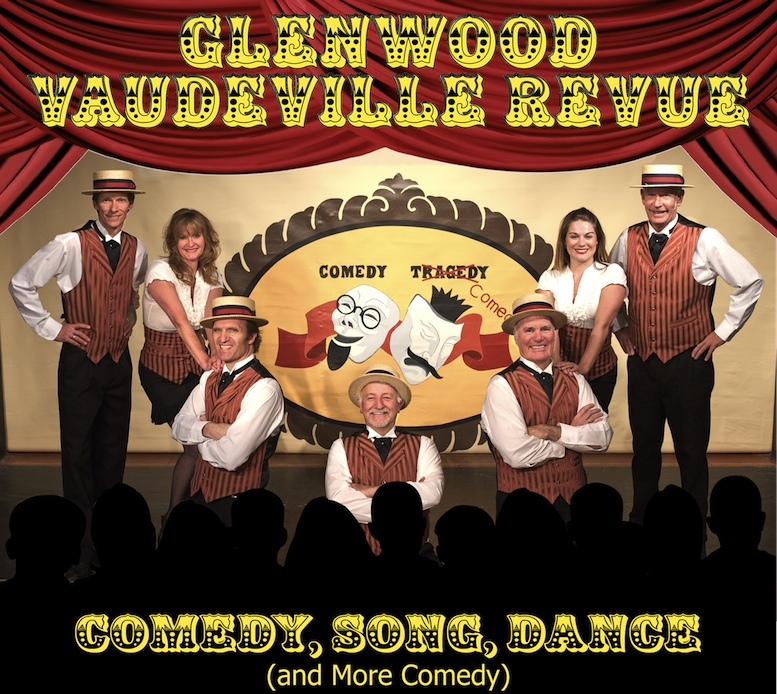 Let The Glenwood Vaudeville Revue take you back 100 years, back to a time when Vaudeville was the only entertainment around. When acts of all kinds traveled across the country performing in quaint community theatres; and when going to the local theatre to see a vaudeville show was the entertainment highlight of your year. Great fun for the family! The Glennwood Vaudevillle Review show is excellent. We first saw the show in October 2016, and couldn't wait to see it again. I can't say enough about the quality of the performance, you will literally laugh the entire evening. The laughter and the food are the best anywhere! John's zest for life and his Wurlitzer are contagious. The entire super talented cast rocks it out with gusto and side splitting antics for hours until we go home exhausted from laughing so hard and exhilarated and inspired for the days ahead. Solomon said " Laughter is good medicine". The Glenwood Vaudeville Review is the cure for what ails us! Amazing time and great entertainment. Would recommend you go, we have been three times and will go back every time we are in the area. 5th time. Seen all three seasons. All are very entertaining. I have came to many shows. My fiance and I have loved every one! This time I brought my girlfriends and they loved it as well! My friends and I absolutely LOVE your show. The talent is amazing, the acts are clever and often down right hilarious. I can’t think of another show that provides 2 1/2 hours of laughter. I’m always looking forward to the next show. Very fun evening. Everyone makes you feel at home and part of the fun!! Super show, cast and staff. Will be back! you guys always take great care of our car club when we come. Thanks for a great night as usual. We will be back. Ron Madsen President  Valley cruisers car club. My boyfriend and I went to this show on 2/17/18 and it was absolutely amazing. We laughed throughout the show and it was good, clean humor. I would highly recommend this show! We will definitely be going to this show again this year. Amazing. Great night out. A must do for both locals and visitors. We had a fantastic time. Very talented, hard working staff! Thank you so much for providing such great entertainment. I highly recommend this show if you are in Glenwood Springs. I love the show. I love the interaction with the audience. I highly recommend going. We went this past Saturday and had a GREAT time! We'll be back during Spring Break for sure! Great night out with friends to an amazing show!!!!! Great show. I always have a good time. My parents were visiting from MN- very fun experience for the whole family! Thanks John!! Any time my wife and I take a vacation in Glenwood Springs, we always have to go to the Vaudeville. It's one of the most fun activities that can be had there. Awesome show, action packed and worth every penny! GREAT TIME....HIGHLY RECOMMEND... WE HAD A WONDERFUL EVENING. A MUST TO SEE WHILE IN GLENWOOD SPRINGS COLORADO. The show was amazing! Good family entertainment, with laughs for everyone. It’s an all around good time. Tommy is hilarious!!! And a good server too! The whole package. Everything was great, as always. We shared our table with some really nice folks from Ohio. I do miss the dramatic reading. That was always my favorite part. The new actors did a great job. It was my friend's first time, and she loved it. Always a good time at the Vaudeville! !